As you walk around the ancient city of Edinburgh you might notice several sections of fortified wall that seem slightly out of place in relation to the other buildings that stand alongside them. 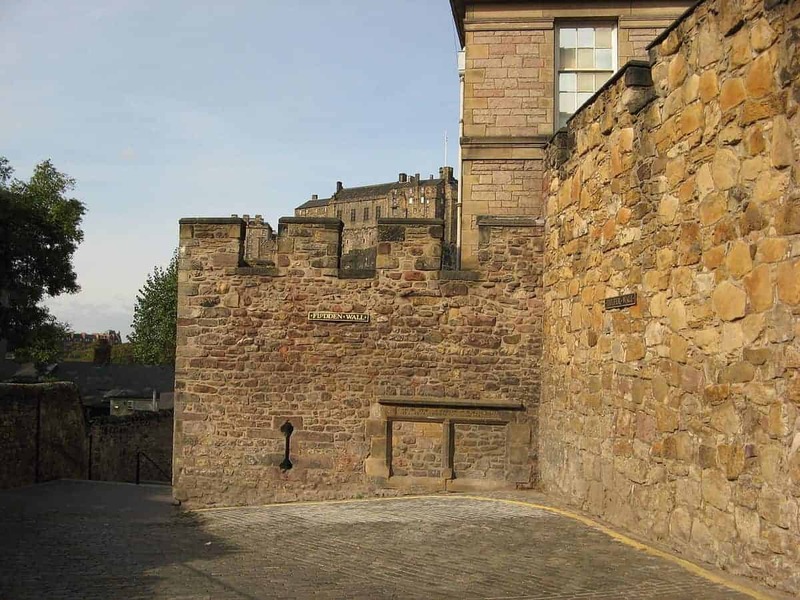 These walls are the remains of an immense fortification that at one time encircled the entire Old Town area of the city, and their story is a fascinating glimpse into the history of both Edinburgh and Scotland. Today, there are only a few locations where the walls are still standing, so if you’re unaware of the history of the Flodden Wall you’ll probably walk past without taking any notice. But if you’re curious about the history of Edinburgh and the role these few remaining ruins played this guide will tell you why you should definitely add them to your list of ‘must-see’ city sights. While there are some tours that will take you around all the remaining sections of the Flodden Wall the best way to see it (in my opinion) is to grab a tour book and explore the streets of Edinburgh for yourself. If you keep a watchful eye out you might see several brass cobblestones embedded into Edinburgh’s streets which mark the boundaries where the original wall once stood, and searching for them is a fun way to keep the kids occupied while walking through the Old Town. You’ll be shown these markers if you follow one of the many organised history tours that regularly depart from behind St. Giles Cathedral, but if you want to go on a hunt yourself a good place to start is the road outside the World’s End pub halfway up the Royal Mile (but please take care on the road as it’s not fully pedestrianised). For a real taste of how big the Flodden Wall was in its heyday you should take a journey to Greyfriars Kirk where one of the last remaining sections can still be seen. It’s incredible to think that at one time such a massive wall completely encircled the city and at the same time it’s sad to think that so few sections of it still remain intact. The Flodden Wall is most definitely one of the more unusual sights in the beautiful city of Edinburgh. The Flodden Wall was completed in 1560 and was built in response to the Scots army defeat at the battle of Flodden in 1513. There, the armies of King James IV were defeated by the English, and fears of an English retaliation prompted Edinburgh’s councillors to propose a defensive wall to protect the city. The wall would also go some way to dealing with the smugglers that were blighting trade in the capital and it would be an important tax revenue for traders who needed to enter and exit the city. But it was the latter point that eventually led to its destruction. Standing 24 feet tall with walls nearly 4 feet thick, the Flodden Wall enclosed an area of almost 140 acres. But as the population of Edinburgh grew the presence of the wall began to be resented due to the high taxes that had to be paid every time anyone wanted to enter or exit the city. It’s for this reason that the famously-high tenement buildings of the Old Town were built because without any way to build out the architects of the time could only build up, so you could say the reason Edinburgh looks the way it does today is thanks to the construction of the Flodden Wall. Although the impending English invasion never materialised the wall survived and was instrumental in protecting the city for many years, but as with many of the city’s old buildings it slowly became a shadow of its former self. After the threat from the Jacobite uprising ended in 1746 the Flodden Wall was left poorly maintained and either collapsed or was built over in the ceaseless expansion of the city, so that today only a few small sections can still be seen standing. But even though it’s difficult to appreciate how impressive this wall must have been when it was first built I think its remains are a bit of a hidden gem in Edinburgh, and one that’s well worth keeping an eye open for. The remains of the Flodden Wall lie in several areas around the city, and there are various routes you can take to visit them. However, the most visited section lies in Greyfriars Kirk graveyard although it can also be seen where Drummond Street meets the Pleasance, and again on Forrest Road. The Flodden Wall is accessible at all times of day and there is no fee to view any of the remaining sections.